Why do electricians need safety gloves? Working with electricity is very dangerous. You must always make sure to wear the appropriate safety equipment, including gloves. Rubber insulating gloves are probably the most important personal protection an electrical worker can wear. In order to be effective, these gloves must combine high physical strength and dielectric qualities, along with durability and flexibility. For the best performance, the gloves should meet or exceed American Society for Testing and Materials requirements and specifications. The safety gloves should also pass ASTM D120/IEC903 electrical tests and specifications. Rubber Insulating Gloves – These are classified by how much voltage the gloves can protect against and the level of protection they can provide. It’s not always required to wear insulated gloves. 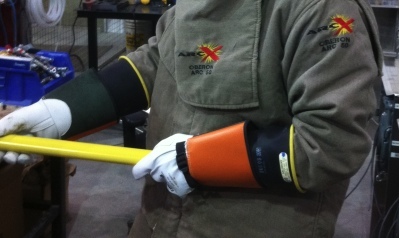 While working on non-energized equipment, Kevlar gloves are the ultimate selection. They provide the best protection from cuts, scrapes and abrasions. Liner Gloves – These are worn to reduce discomfort that sometimes comes with wearing the rubber insulating type. They are ideal for all seasons and can be used year-round. The liners keep you warm in cold weather and absorb sweat on hot days. They are usually made with a straight cuff or a knitted wrist. Leather Protective Gloves – These are designed to be worn over top of rubber insulating gloves. They provide extra protection against cuts, scrapes and punctures. Make sure to get the steam pressed type with curved hand forms. These provide a much better fit over your rubber gloves. Protect your hands from cuts and scrapes! Electricians have to work with or close to live electrical currents all the time. This puts you in constant danger of electrical shock or electrocution. Wearing the proper personal protective equipment is crucial. The Occupational Safety and Health Administration has clear guidelines outlining the design, care and proper use requirements for all electrical safety equipment. This includes insulating gloves, sleeves, blankets, mats, covers and hoses. Electricians have to work with, or close to, live electrical currents all the time. This puts you in constant danger of electrical shock or electrocution. Wearing the proper personal protective equipment is crucial. Electrical grade protective gloves are classified by how much voltage they can protect against and whether or not they are ozone resistant. Class 0 – Provides for a maximum of 1,000 volts AC, and is proof tested to 5,000 volts AC. Class 1 – Provides for a maximum of 7,500 volts AC, and is proof tested to 10,000 volts AC. Class 2 – Provides for a maximum of 17,000 volts AC, and is proof tested to 20,000 volts AC. Class 3 – Provides for a maximum of 26,500 volts AC, and is proof tested to 30,000 volts AC. Class 4 – Provides for a maximum of 36,000 volts AC, and is proof tested to 40,000 volts AC. Ozone resistance for safety gloves is covered under the “Type” designation. Type I gloves are not ozone-resistant, Type II gloves are. 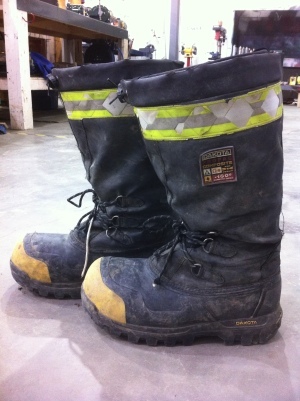 OSHA requires that all protective equipment must be properly maintained and kept in a safe and reliable condition. This means that all rubber insulating gloves must be inspected every time you use them for any damage. Additionally, all insulating gloves must have an air test as part of the regular inspection. OSHA does not explain how this test is supposed to be performed. However, you can find the proper testing method in ASTM F 496. It states you should fill the glove with air, either manually or with an inflation device, and then check for leaks. You can check for leaks by listening closely for air escaping or by feeling for the air leak. Do not inflate the glove more than one and a half times its normal size for Type I gloves and not more than one and a quarter times its normal size for Type II gloves. You should repeat the air test with the gloves turned inside out. In addition to this routine testing, it is recommended that all electrical protective equipment be electronically tested about every six months. 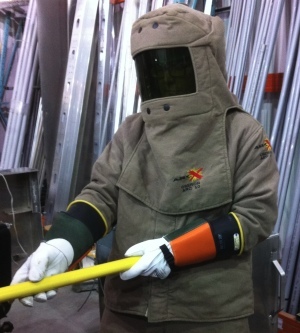 If the protective gear has been unused for a long period of time, it should have an electrical test and thorough physical examination before use. In order for your gloves and sleeves to be able to give you the protection you need, they have to be well cared for and properly stored at all times between use. Your pre-use inspection should include checking for all types of possible damage. Look for holes, tears, rips, UV damage and any signs of possible chemical damage or deterioration. Petroleum products can cause all sorts of damage. Check gloves and sleeves carefully when working with these types of products. The first signs of possible chemical contamination is swelling in the contaminated area. If you suspect your equipment might have been contaminated or suffers from any type of damage, you should turn it in to your supervisor or safety inspector for a thorough physical inspection, electrical inspection and a good cleaning. Electrical safety gloves and other protective equipment is not cheap. Many companies provide these for you, but if you have to buy them yourself you might be tempted to cut corners. This is not a good idea. Spending a few extra bucks can save you from serious injuries, or worse. You may think the leather protective gloves are a waste of money and may be tempted to just buy the rubber gloves. The rubber gloves provides insulation, but you need the leather glove to protect against other injuries like cuts and scrapes. You will also want the liners for extra comfort. Always buy your safety gloves and all safety equipment from a reputable company and make sure they comply with OSHA regulations and standards.